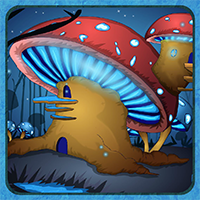 Description: 2013th-THE CIRCLE-MUSHROOM CITY: Now you to find the eighth object was in the Floating city. So you need some flying vehicle to go to the Floating city. First, you have to go to the Mushroom city to find a Flion (flying lion), which used to fly. But, Flion were injured in its wing. Now you have to collect some useful objects to make a medicine to cure the injury of the Flion and then using the Flion as a vehicle to go to the Floating City. Have fulfillment while playing escape games.